In a big boost to electronic manufacturing clusters in Uttar Pradesh, major mobile and smartphone manufacturing companies, Micromax and OPPO have proposed to set up mobile phone manufacturing units at Greater Noida. Mobile Company Oppo’s global vice-president Eric and CEO of Micromax Group Rajesh Agarwal met Uttar Pradesh Chief Minister Akhilesh Yadav at his official residence here today. Delegates from Oppo mobile company presented a proposal to set up a mobile manufacturing unit at the Greater Noida or Yamuna Expressway electronic manufacturing cluster. They informed the CM that the company has been producing 16 lakh mobile phones per month from its existing unit in Noida. With the proposed project kicks off, the capacity of company would shoot up to five crore mobile phones in India in the next three years. The company will invest Rs 1000 crore on its own and Rs 1000 crore would be invested by its partner companies, taking the total investment to Rs 2000 crores. A 150 acre stretch of land is required for the project and with the project commenced, 60,000 people would get direct and indirect employment. The Chief Minister assured the delegation of all necessary help under the UP Electronics Manufacturing Policy-2014, leaving aside the cost of the land. The Chief Minister requested the delegation to identify a land for the proposed project and to start work on the project at the earliest. 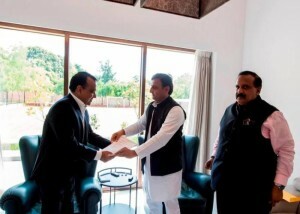 Other than this, the Chief Minister also handed over the land allotment letter for 16.88 acre land for establishing a factory in the electronics manufacturing cluster at Greater Noida to the Bhagwati Products Ltd (Micromax Group). Chief Executive Officer of the company Rajesh Agarwal said this factory would produce 60 lakh mobile phones every year. The Micromax Group also presented a proposal for investment of Rs 210 crore and they were also assured various encouragements under the UP Electronics Manufacturing Policy-2014. Uttar Pradesh Chief Secretary Deepak Singhal directed the officials to provide all the facilities on priority to Micromax and OPPO mobile phone manufacturing companies to set up their units in Greater Noida.